Buckwheat is very tasty and almost unique in its nutritional properties. It is perfect for cooking a hearty main dish, and in the period of fasting and is indispensable as a rich source of not only carbohydrates, vitamins and fiber and vegetable protein. 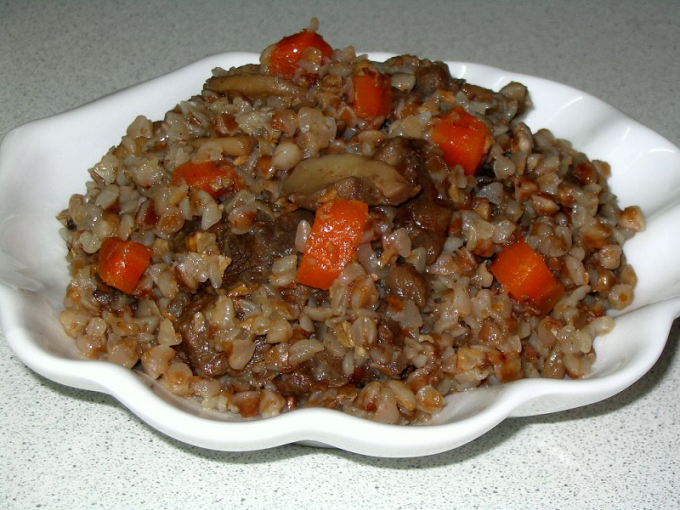 Familiar taste of buckwheat for a side dish can vary from cook meat, mushroom or vegetable gravy. Wash the meat, dry and cut into small cubes. Peel onions and slice thin half-rings, grate carrot on a small grater. Fry the meat pieces in hot oil, constantly stirring them with a wooden spatula until it will turn brown. Put in a pan prepared vegetables. Cook the roast for 5-7 minutes, then pour in 100ml water and simmer, covered on low heat for 5-10 minutes. Put the pot on the neighboring burner, melt in it the butter and add small portions of flour and fry until turn light brown. Add a pint of water, don't stop stirring the mass, to avoid lumps. Prepare a thick sauce, then pour it to the meat, all stir well, and season the gravy with pepper, salt and Bay leaf. Keep it on low heat for another 10 minutes. Meanwhile make a garnish of buckwheat. - 0.5 teaspoon of salt. In winter, the fresh mushrooms you can substitute frozen, in this case it is better to take the already sliced product. It can not be thawed and not boil, and immediately send into the pan. Boil the mushrooms for 10 minutes, cool and slice. Detach the bulb from the husk and chop with a knife or grate on a coarse grater. Throw in a heated pan of butter and saute the onions over medium heat until transparent, 2-3 minutes. Put to it the mushrooms, cook them until cooked, season with salt, sprinkle with flour, stir and pour cream. Give a delicious dish to boil, immediately remove from heat and pour buckwheat. Cut the peel from the eggplant, remove the skin from the tomatoes and top with onions and coarsely chop the vegetables. To easily remove the skins from the tomatoes, scald it with boiling water or just scrape it with the back of your knife blade. It will darken and descend effortlessly. Lay them in the skillet or pan with vegetable oil, Ugarte by about half and add salt to taste. Put crushed garlic, add 2-3 tablespoons of water and simmer for 3-5 minutes. Serve flavorful vegetable gravy with buckwheat on the water.